Hi everyone! Since my past two blogs have been recipes... just because I've been baking alot, I decided the change it up a bit a do a book review instead this week. 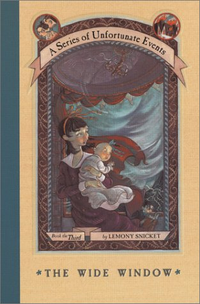 This time I am doing the book review on: A Series Of Unfortunate Events 3: The Wide Window. I will most probably be writing a book review on almost all of the Series of Unfortunate Event series... although they might not be in order. The book, The Wide Window is from the series: A Series Of Unfortunate Events, By: Lemony Snicket. On a scale from 1 (negative)-5 (positive), I would give this book series a 4.5. Here are some links to some other reviews on this product: http://www.amazon.com/Series-Unfortunate-Events-Wide-Window/product-reviews/0439759064/ref=dp_top_cm_cr_acr_txt?ie=UTF8&showViewpoints=1 http://www.chapters.indigo.ca/Home/Books/a-series-of-unfortunate-events/9780064407687-AllReviews.html http://www.goodreads.com/book/show/438492.The_Wide_Window Some of the best things about these books (the pros) are firstly, it is from a series, so in the store until your done that series instead of having trouble finding a book, you know what book to get right away. Secondly, it has a ton of descriptive words. Thirdly, it has all kinds of different genres. Fourthly, it’s in third person's point of view. Lastly,at some points the author is actually talking to you, which I found was very interesting. The only bad thing I can name about this book (the con) is, it is a very sad, depressing book. Even though the point of this book is to have only unfortunate events, I think there should be happy endings. Although I thought it was a very sad depressing book some people like those kinds of books. I think people who like mystery or tragedy books would like this book best. There are many genres to this book, but these two are the main ones. I think the age group for this book is 8-12. I think The Wide Window is one of the best books I’ve ever read. Well, that was my opinion on A Series Of Unfortunate Events 3: The Wide Window. Thank you so much for reading and I hope this helped. Please comment if this helped, and if you do read the book, how the book was. Thanks.